Dermal Fillers and Fat Injections deliver a non invasive treatment giving you a more rested, youthful appearance without surgery. Procedure: Plump up creased, furrowed, or sunken facial skin; add fullness to lips and backs of hands. Anesthesia: Dermal Fillers: usually none; local may be included with the injection. Fat: local with sedation. Soft-tissue fillers, most commonly injectable dermal fillers or fat, can help fill in these lines and creases, temporarily restoring a smoother, more youthful-looking appearance. When injected beneath the skin, these fillers plump up creased and sunken areas of the face. They can also add fullness to the lips and cheeks. Injectable fillers may be used alone or in conjunction with a resurfacing procedure, such as a laser treatment, or a recontouring procedure, such as a facelift. If you’re considering a facial-rejuvenation treatment with dermal fillers or fat, this page will give you a basic understanding of the procedure – when injectables can help, how the procedure is performed, and what results you can expect. It may not answer all of your questions, since a lot depends on your individual circumstances. Please ask Dr. Mabourakh if there is anything about the procedure you don’t understand. Injected dermal fillers and fat are primarily used to improve the appearance of the skin’s texture. They can help fill out deep facial wrinkles, creases and furrows, “sunken” cheeks, skin depressions and some types of scars. They can also be used to add a fuller, more sensuous look to the lips. Injectables are usually not sufficient for severe surface wrinkles on the face, such as multiple vertical “lipstick lines” that sometimes form around the mouth. Instead, Dr. Mabourakh may suggest a resurfacing technique, such as chemical peel or laser treatments. Rather than filling in facial lines, resurfacing methods strip away the outer layers of the skin to produce a smoother appearance. Keep in mind that Dr. Mabourakh is a specialist that can offer you the full gamut of the most advanced treatments ranging from cosmetic surgery, refinishing techniques, laser therapy, injectables and the use of other fillers. You and Dr. Mabourakh may determine that a single procedure or a combination of procedures is the best choice for you. Brochures are available on chemical peels, laser treatments, facelift and browlift. If you and Dr. Mabourakh think that one of these other procedures might be more appropriate for you, ask your Dr. Mabourakh to provide you with a copy. This page deals with the most commonly used types of injectable fillers and fat. However, there are a number of other filler materials are also being used for facial-rejuvenation purposes. Such as Juvederm, Restylane, Belotero, Voluma and Radiesse. These offer excellent results with little or no down time. Each of these options has its own set of risks and benefits. If you’re considering any of these alternative filler treatments, tell Dr. Mabourakh. If you’ve had short-lived results from fat injections, you shouldn’t necessarily assume that dermal filler injections will work better for you. And, conversely, if you’ve had disappointing results from dermal fillers, don’t assume that injected fat is the answer. Although it’s true that some individuals’ bodies are more receptive to one substance than the other, others may find that neither substance produces long-lasting results. Sometimes one substance may work better than the other for a specific problem. Facial rejuvenation is very individualized. That’s why it’s important to discuss your hopes and expectations with Dr. Mabourakh who has experience with many different types of surgical and non-surgical facial procedures. In your initial consultation, Dr. Mabourakh will evaluate your face – the skin, the muscles and the underlying bone – and discuss your goals for the surgery. Dr. Mabourakh will help you select a treatment option based on your goals and concerns, your anatomy and your lifestyle. Injectables are usually administered in Dr. Mabourakh’s office-based facility in Sacramento, CA. If, however, you are on the schedule for a facelift, necklift, browlift, or any other procedure, your injections may be combined with your surgical procedure as well. Dermal Fillers: Because the anesthetic agent lidocaine is sometimes mixed in with the filler, additional anesthetic is usually not used. However, if you are especially sensitive to pain, Dr. Mabourakh may use a topical cream anesthetic or a spray to numb the injected area. Or, you may elect to have an injected local anesthetic or sedative drugs. Collagen is a naturally occurring protein that provides support to various parts of the human body: the skin, the joints, the bones and the ligaments. Injectable collagen, patented by the Collagen Corporation under the trade names Zyderm and Zyplast, is derived from purified bovine collagen. The purification process creates a product similar to human collagen. Injectable collagen received approval from the Food and Drug Administration in 1981. It is produced in various thicknesses to meet individual patient needs. The procedure: Treatment with collagen can begin after a skin test determines that you’re not allergic to the substance. 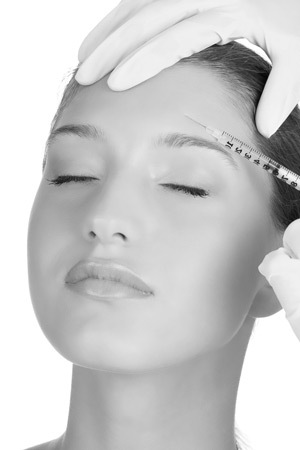 The collagen is injected using a fine needle inserted at several points along the edge of the treatment site. If a local anesthesia has not been used, you may feel some minor stinging or burning as the injections are administered. Since part of the substance is salt water that will be absorbed by the body within a few days, Dr. Mabourakh will slightly overfill the area. You may be asked to hold a hand mirror during the procedure to help him decide when you’ve had enough. No bandaging is needed and you are free to eat, drink, and wear makeup with sunblock protection shortly thereafter. There may be some temporary swelling and redness in the treated area which should dissipate within a few days. If these symptoms persist, contact Dr. Mabourakh. Results: As stated earlier, the duration of results from collagen injections is variable. Collagen’s longevity depends on the patient’s lifestyle and physical characteristics as well as the part of the body treated. In general, the injected material is likely to disappear faster in areas that are more affected by muscle movement. Dr. Mabourakh can help you determine how long you can go between treatments to best maintain your results.